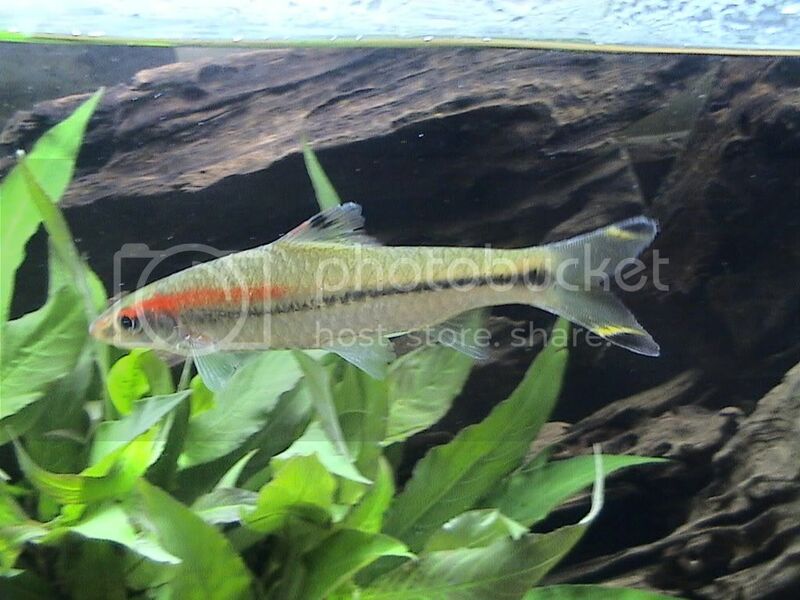 indianaquariumhobbyist.com Forums » Post 152551 » Re: Puntius denisoni and Puntius chalakkudyensis difference. Posted: Wed Jun 10, 2009 6:44 pm Post subject: Re: Puntius denisoni and Puntius chalakkudyensis difference. Joyban both those fish are denisoni mate, the chala is different again in it's shape position of the mouth and the solid black marking in the dorsal fin. Posted: Wed Jun 10, 2009 7:00 pm Post subject: Re: Puntius denisoni and Puntius chalakkudyensis difference. I second that. Dark blotch on the dorsal is a distinct difference. Ofcourse they are supposed to grow much larger than denisonii. BTW its spelt Puntius chalakudiensis. I would put my neck out and say this pic shows the difference between a normal denisonii and a stressed one. Posted: Wed Jun 10, 2009 7:12 pm Post subject: Re: Puntius denisoni and Puntius chalakkudyensis difference. Posted: Wed Jun 10, 2009 7:21 pm Post subject: Re: Puntius denisoni and Puntius chalakkudyensis difference. Posted: Wed Jun 10, 2009 7:23 pm Post subject: Re: Puntius denisoni and Puntius chalakkudyensis difference. Posted: Wed Jun 10, 2009 9:15 pm Post subject: Re: Puntius denisoni and Puntius chalakkudyensis difference. Posted: Fri Jun 12, 2009 5:50 am Post subject: Re: Puntius denisoni and Puntius chalakkudyensis difference. this is Heiko Bleher and I find it very interesting the thread. There are still some people which do not undertsnd the difference between the two similar species (and other who do not want to see it...). Those 2 pictures sghown here are correctly identified and the lower is P. chalakkudiensis and the upper P. denisonii. 1. P. denisonii is always bright red (the stripe and around mouth) vs. chalakkudiensis hardly ever bright red striped - as seen here. 2. P. denisonii has a bright red dorsal fin WITHOUT black in it vs chalakkudiensis has a black mark (not really a spot) in the dorsal fin, which is mostly in the former rays and upper part of the dorsal fin, and the same has hardly reddisch colours (as seen here in the lower pictures). 3. P. chlakkudiensis is always more blend and tail colours are different from the P. denisonii, and bigger (the tail), as seen here. 4. And as mentioned here already, P. chalakkudiensis grows much larger than P. denisonii and the former is ONLY found in the Chalakkudy river. Posted: Fri Jun 12, 2009 8:56 am Post subject: Re: Puntius denisoni and Puntius chalakkudyensis difference. I really doubt, apart from the Black blotch and size of fish, if anything else is written in the Key to the species'. Posted: Fri Jun 12, 2009 9:22 am Post subject: Re: Puntius denisoni and Puntius chalakkudyensis difference. If our experts are getting confused, God save novices like me. Posted: Fri Jun 12, 2009 10:38 am Post subject: Re: Puntius denisoni and Puntius chalakkudyensis difference. I will not comment on this issue anymore, if anyone has his doubt than it may be so for his own sake. For the scientific community and its description these are the two species, as shown here and what I mentioned are the characters which are visible and for any layman to destinguish the two visually (there are many more but those only under the microscope. Posted: Fri Jun 12, 2009 12:21 pm Post subject: Re: Puntius denisoni and Puntius chalakkudyensis difference. these punties denisoni chalakkudyensis is from the river chalakkudy, thrissur,the colorfull redline punties denisoni is in irrity thrissur in kerala. Posted: Fri Jun 12, 2009 12:38 pm Post subject: Re: Puntius denisoni and Puntius chalakkudyensis difference. There is no fish called Puntius denisonii chalakkudiensis. I hope you know the meaning of it when it is written in such form. It means the later is a sub-species of the former. denisonii and chalakkudiensis are two different species. Posted: Fri Jun 12, 2009 9:22 pm Post subject: Re: Puntius denisoni and Puntius chalakkudyensis difference. i'm afraid i still have to dissagree with Heiko on the two pics, having seen the chala and plenty of denisoni i can tell which species is in the tank at a distance. Posted: Sat Jun 13, 2009 4:16 am Post subject: Re: Puntius denisoni and Puntius chalakkudyensis difference. have you been to the Chalakkudy river and collected the endemic Puntius there? I would like to know. As I was there 3 times and also in all the other known habitats of P. denisonii. If you have done this as well and seen the fish in the wild and taken it to aquaria (from the type locality) and studied it from those type locality, than I am willing to argue with you further in the UK, otherwise do not waste your, nor any one elses, time.